Turo, the peer-to-peer car-sharing company described as the “Airbnb of cars,” is rolling out a new product that will let users locate and unlock cars right from the app. The new product, called Turo Go, is a dongle and an accompanying service that aims to bolster the number of cars and users on its platform. The product is designed to remove a barrier of entry — the time required to physically exchange keys — that once was a hallmark of the platform. As part of the Turo Go service, owners can opt to allow users to find, book and unlock a vehicle in as little as five minutes. Currently, the app requires a minimum 60-minute lead time before a customer can pick up a vehicle. The company is launching Turo Go in Los Angeles, where it has the biggest penetration of hosts who have multiple vehicles on the platform. Turo Go will expand to additional markets in 2019, he added. Turo Go uses an aftermarket key-as-a-service entry device from Continental. The device doesn’t require any hardwiring, although it takes about an hour for the install. The device is connected to the OBD-II port (on-board diagnostics) found on modern vehicles. A hidden antenna connects the device to the ignition. Turo Go costs $20 a month. Turo also charges a $150 installation fee to owners who want to add the device to their vehicle. Car sharing and on-demand short-term car rental companies like Zipcar also use remote unlock and lock tech. This product is being used on a peer-to-peer car-sharing app, which makes it standout a bit. Although there other peer-to-peer companies using similar features. Turo Go provides a technological upgrade of sorts that is designed for Turo’s experienced hosts, “people who have become comfortable with the notion that a stranger will be in their car,” Haddad said. Once the device is installed, users will be able to find the vehicle, instantly book it and unlock or lock it via the app. And unlike other car-sharing services, the device uses Bluetooth technology and doesn’t rely on a cellular connection, which can be problematic in parking garages or other remote areas with spotty network coverage. Turo Go also has a digital ID verification step, which uses facial recognition technology to confirm that users have the proper license and are who they claim to be. The tech matches the ID photo to a customer’s face and uses movement tracking to ensure the customer is a real person in front of the camera rather than just a static image that has been printed out. Once a user has completed a trip, owners of vehicles equipped with Turo Go will be able to locate their car, truck or SUV. Haddad emphasized that owners will not show the location of the vehicle while a customer is using it. 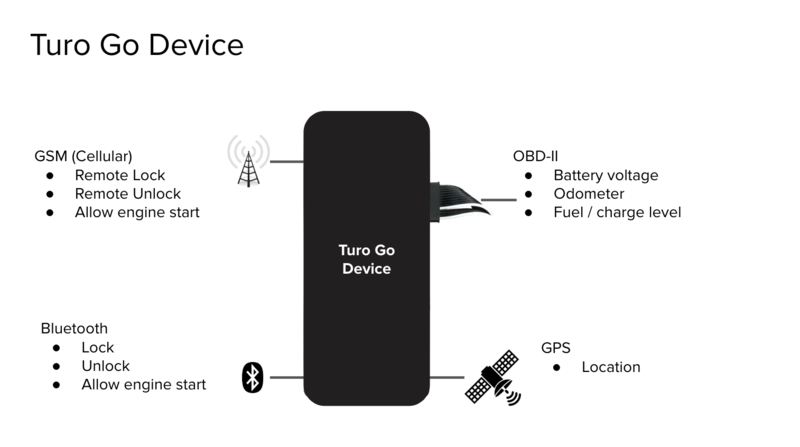 Turo Go will also provide other information, such as odometer and fuel levels. Other data features will be added to Turo Go in the future.